Hi! I am a beaver and I am a gentle guy who loves to play practical jokes. I think that apples, clover, and the bark of trees like the aspen are really yummy. After I peel the leaves from the bark, I use the sticks to build my house on a little dam over a stream. If you see the dam I built, you will agree that I am really an excellent engineer too! 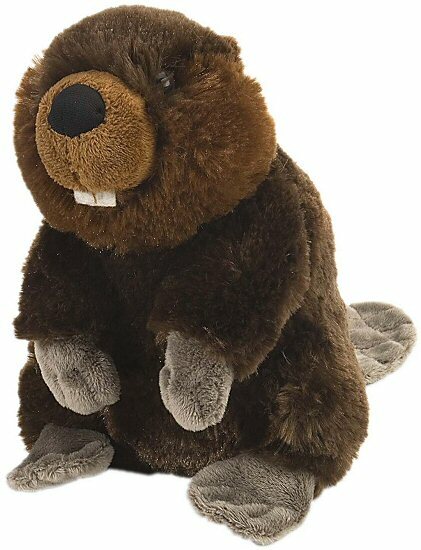 A portion of the proceeds from the sale of this fun Mini Cuddlekins stuffed beaver helps to provide housing and education for disadvantaged children, as well as protection for abandoned animals throughout the world. Fun Facts: Did you know that beavers can live up to 24 years and that a group of beavers is called a colony? Builder, this adorable little Mini Flopsies stuffed beaver, has wonderfully soft brown fur, tan face, and large floppy tail. Wilson Jr., this sweet little stuffed beaver has soft brown fur, floppy tail, perky ears, and fun buck teeth.